This morning Horizon’s parent company, Hitachi, announced that they are suspending their work on the Wylfa Newydd project on Anglesey and a further second project in Oldbury, Gloucestershire. The decision comes after months of formal discussions between Hitachi, the British and the Japanese governments seeking agreement over a viable financial model for the projects. Hitachi will retain the ownership of the land while it continues discussion future options with the UK Government. The UK Government said that its arguments are based on the lack of good value for money for the UK taxpayer, and it has refused to make a similar offer of a guarantee price – known as “strike price” – like the one offered to EDF at Hinkley Point C in 2012. The Secretary of State also expressed the intention to continue working with Hitachi over the next weeks and months to bring forward nuclear projects at both Wylfa and Oldbury; and to champion the nuclear sector in North Wales. Furthermore, he invited Members across the house to consider the proposals for the nuclear energy sector in the planned Energy White Paper, which is due publication next Summer. Duncan Hawthorne, chief executive of Horizon said: “We have been in close discussions with the UK Government, in cooperation with the Government of Japan, on the financing and associated commercial arrangements for our project for some years now. I am very sorry to say that despite the best efforts of everyone involved we’ve not been able to reach an agreement to the satisfaction of all concerned. “Clearly this will have a significant impact for all involved with our project. We will look to minimise this as much as possible as we move into this next phase and we will begin consultation on the implications immediately with our staff who have shown extraordinary talent, resilience and determination to take this complex and exciting project to this stage. “We will also engage closely with the many international and UK-based stakeholders who have strongly supported the project’s development, especially our lead host community of Anglesey in Wales, represented by the Isle of Anglesey County Council and Welsh Government, and the key representatives around Oldbury. Hitachi’s decision follows news last November of the cancellation of plans for new nuclear facilities in Moorside, Cumbria, after Toshiba closed its NuGeneration subsidiary. The Nuclear Industry and the trade unions have expressed their disappointment and their concern about the loss of jobs and the negative economic impact on both areas due to the abandonment of the projects. 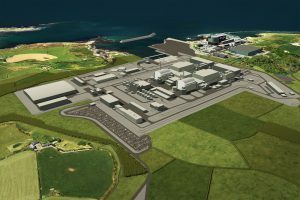 Tom Geatrex, chief executive of the Nuclear Industry Association, said: “Today’s news is disappointing, not just for the Wylfa Newydd project but for Anglesey and the nuclear industry as a whole. Wylfa remains a strong site for vital new nuclear power fo the UK. “It is regrettable that this project has been suspended, especially as a considerable amount of groundwork has already taken place including creating a supply chain to deliver the project. Nuclear at Wylfa has local support, and the Horizon project would provide 60 years of reliable, secure, lo carbon power for homes, business and public services. “Wylfa is part of the UK’s nuclear new build programme, which is proceeding with Hinkley Point C which is on track. A third round of consultation for Sizewell C is underway and the approval process for the reactor design at Bradwell B is proceeding. The urgent need for further new nuclear capacity in the UK should not be underestimated, with all but one of the UK’s nuclear power plants due to come offline by 2030. If we want a balanced generation mix, Government must work with industry to deliver that vital capacity on this site. At stake are our ability to provide bulk, low carbon power, energy security, and the potential loss of the chance of thousands of highly skilled, well paid jobs in Wales and the North West of England. Over 300 jobs will be lost at Wylfa, and the impact on the supply chain could affect the creation of thousands. Justin Bowden, GMB National Secretary for Energy said:“Hitachi’s announcement, coming so soon after the Moorside fiasco, raises the very real prospect of a UK energy crisis. “While the Government has had its head up its proverbial backside over Brexit, vital matters like guaranteeing the country’s future energy supply appear to have gone by the wayside. “The go ahead on a new, part publicly funded power station at Wylfa, and the accompanying creation of thousands of new jobs and apprenticeships, was an unusual outbreak of common-sense in UK energy policy. “This decision has nothing to do with costs. The planned reactor at Wylfa is not the ‘first of a kind’, and this fact – combined with the Government stake – would ensure Wylfa was built at a cost much lower than Hinkley Point C currently under construction in Somerset. “The Government must act and step in now, pick up the reins and take whatever funding stake and leadership is necessary, to ensure Wylfa goes ahead on time. At the end of the day, it is a basic function of the Government to guarantee we have enough electricity for our homes and industries and history shows that voters do not forgive or forget when the lights go out. “New nuclear is almost zero carbon and because it produces energy 24/7 it is a perfect complement to wind and solar – which everyone knows don’t work all the time.